In the greatest epic Ramayana, there are so many interesting anecdotes. One interesting is of the little squirrel. Lord Sri Rama had to cross the sea to reach Lanka and his warriors were involved in building bridge across the sea. Mighty monkeys and powerful bears were carrying huge bolsters and putting them on the sea and alongside was a small squirrel, putting small pebbles and then drenched itself in sea water, ran to shore, rolled itself thus making its body full of sand – then off-loading that sand on the bridge – it was perfect example of not getting overawed by the situation nor by what others did, but contributing one’s mite towards fulfillment of the target. 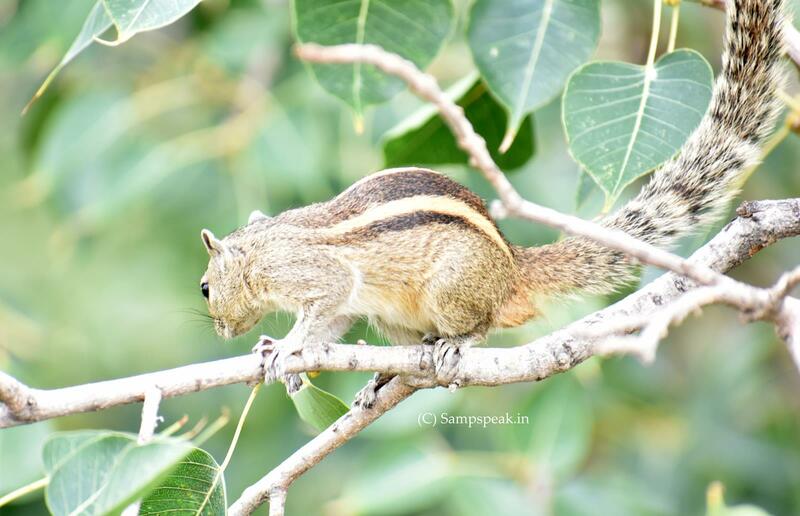 ~ and we know that Lord Sri Rama was so compassionate .. ..
"Squirrel is a high level imperative, object-oriented programming language, designed to be a light-weight scripting language that fits in the size, memory bandwidth, and real-time requirements of applications like video games." ~ in civil society there are some who terrorise, who put fear into people pursuing their objectives ! ~ and can squirrel the little one, ever be considered as one ? Over there in Germany, the Federal Police (Bundespolizei or BPOL) is a (primarily) uniformed federal police force in Germany. It is subordinate to the Federal Ministry of the Interior (Bundesministerium des Innern (BMI)). Ordinary police forces, meanwhile, are under the administration of the individual German states (Bundesländer) and are known as the Landespolizei. Squirrels are members of the family Sciuridae, a family that includes small or medium-size rodents. The squirrel family includes tree squirrels, ground squirrels, chipmunks, marmots (including woodchucks), flying squirrels, and prairie dogs amongst other rodents. Squirrels are indigenous to Asia, Americas, Eurasia, and Africa, and were introduced by humans to Australia. Squirrels get lots of attention from humans, but not always much appreciation. We tend to dwell on the stolen birdseed or the occupied attics, yet squirrels have a long, mostly harmless — and often entertaining — history of living in our midst. A couple of years back was a news item that a woman was stalked in Germany, she reported the matter to Police, who duly arrested the stalker ….. it made news because the stalker was a ‘squirrel’ that followed a woman through the streets and she could not escape it. The incident occurred in Bottrop in West Germany; Police responded her emergency call and apprehended the small creature. German news agencies reported that an aggressive squirrel that stalked a woman through the streets of a German city was 'arrested' by police. The worried woman reported the 'nutty' incident to police in the city of Bottrop, after she thought she was being followed by the creepy creature. After failing to shake the animal off her tail, she made an emergency call to police officers, who attended and promptly put the little squirrel behind bars. While being taken care of at the police station, officers worked out that the rodent was showing signs of exhaustion and fed it honey and slices of apple, reported The Local. A video of a Police woman feeding the animal using a pipette and wrapped in a blanket went viral with more than 300,000 times being viewed. In a statement, the force said once the squirrel is well rested it will be passed to an animal welfare centre. Now comes another news involving squirrel and German police. Police have rescued a man after he called for help saying a baby squirrel would not leave him alone. Emergency services received a call on Thursday from the man, who claimed he was being chased down the street by the tiny animal. Police in Karlsruhe said the unnamed man called them in desperation after he was unable to shake off the small rodent. Officers sent a patrol car out to investigate and arrived to find the chase still in full flow. But the drama ended suddenly when the squirrel, apparently exhausted by its exertions, lay down abruptly and fell asleep. Officers took pity on the animal, which had probably become separated from its mother. Police said it likely targeted the man because it was in search of a new home. “It often happens that squirrels which have lost their mothers look for a replacement and then focus their efforts on one person,” said Christina Krenz, a police spokeswoman. She said the animals could be “very persistent, not just running behind someone, but entirely fixated on them. It can be pretty scary. The man didn’t know what to do and so he called the police. He was certainly feeling a bit threatened”. But police on the scene appeared more amused than alarmed. “A squirrel will be our new mascot, it will be christened Karl-Friedrich,” said the police write-up. “The squirrel has fallen asleep in fright.”Krenz said: “It was just a bit of fun. 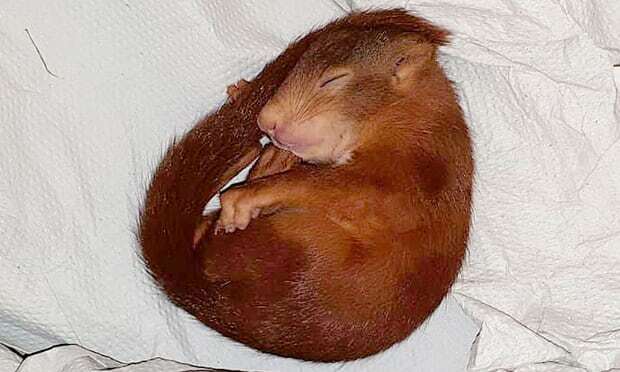 The officers thought up a name that would suit the baby squirrel.” Officers took the sleeping Karl-Friedrich into police custody, and then to an animal rescue centre, where it was said to be doing well. Krenz said the rescue centre was looking after two other abandoned baby squirrels brought in on the same day for similar reasons, though theirs was the only case in which police have had to intervene.